Orpington Juniors was established in 1965 to provide coaching for young people aged 8 and above. Its success and reputation has grown rapidly over the years, welcoming all young people independent of geographic location, background, age, or ability level. We cater not only for those who are ambitious and wish to progress up the badminton ladder, but also those whose needs are more social, fitness or recreational, and the club has adopted a strong ethos in seeking to cater for all players' needs and ambitions. Orpington Juniors has always been a non-profit making coaching organisation. We hire the Harris Academy Sports Hall in Orpington as the main home for all our coaching and playing activities, a location which has a large 3-court badminton hall with halogen lighting and a fully-sprung wooden floor. The annual subscription for the 2018/19 season is £185, which covers 30 weeks (60 hours) of coaching and represents the minimum (break-even) cost of hall hire plus shuttles. Coaches do not receive remuneration of any kind for their time and OJs is entirely volunteer-based, yet it represents one of the largest, and most qualified, coaching teams in Kent. Our current junior membership is 100+ players, distributed approximately evenly across a 6-class structure, and with the age range from around 8 to 17. All coaches and volunteers are DBS cleared at Enhanced Level and this is a rigorously-enforced aspect of our Child Protection Policy. Orpington Juniors established a partnership with Parklangley (in Beckenham) to form the Bromley Performance Centre (Bromley PC). Following the awarding of prestigious PC status by Badminton England in 2009, the Bromley PC continues to be the only PC in Kent and one of only 37 nationally. The aspiration of PCs is to create a centralised hub of badminton activity where players and coaches can progress, reach their full potential and achieve their ambitions. PCs provide a platform to increase competitive opportunities and raise standards for all players, with the aim to exert more pressure on England's top elite band of players. Our emphasis in the Bromley PC includes (a) identifying the right raw talent, (b) implementing the right player pathway to support player development, (c) increasing availability and access to the right level of competition, and (d) involving the right coaches who set the highest standards of professionalism. 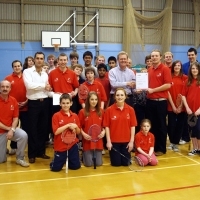 Investment in the Bromley PC by Badminton England has been considerable (£30,000 over the first 3 years alone). 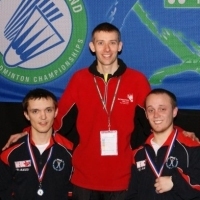 Achieving PC status allows OJs to provide even greater playing opportunities for young people, in particular those players who are ambitious, display considerable potential and early talent for badminton, and who are strongly motivated to progress up the badminton ladder. Acceptance onto the sponsored PC programme is extremely prestigious and by invitation only. Orpington Juniors offers a range of coaching sessions that aim to cater for all ages, needs and abilities. Our structured junior Club Pathway consists of 6 ability-based classes, with Class 1 representing our beginners and progressing up to Class 5, who are our most advanced club players. Each class meets once a week for two hours, with the first hour typically coaching and the second hour match play. Classes are provided primarily at the Harris Academy Sports Hall in Orpington with one other session held at Bromley High School for Girl. Our structured junior Performance Pathway within the Bromley Performance Centre caters for those junior players who are ambitious, display considerable early potential and who are strongly motivated to progress up the badminton ladder. There are currently two Performance Squads (the Raw and the Developing/Emerging Squads), who each meet twice a week for two hours. Acceptance onto the PC programme is extremely prestigious and by invitation only. We can also provide adult coaching sessions, individual coaching, and disability coaching (for which we are a Badminton England Inclusive Club, one of only 10 in England). For further details on joining any of these activities, please contact the Head Coach Paul Parham at paulparham@orpingtonjuniors.com. In addition to our junior and adult coaching activities, our Senior Club is also thriving and serves a number of important roles within Orpington Juniors. As well as providing playing opportunities for adults (both competitive and more social players), our Senior Club evening forms an important bridge between juniors nearing the top of the Club and Performance Pathways and adult/local league badminton. We have 3 teams playing in the winter season of the Orpington/North West Kent league: 1 Mens and 2 Composite. The 2nd composite team is often in one of the lowest divisions to specifically enable juniors with the appropriate skills and maturity from our Club and/or Performance Pathways to play alongside a coach and/or other experienced adult players in adult league badminton. Our first composite and mens teams continue to be successful in Division 1. A fourth team plays in the first division of the Ravensbourne league. Jan Upson, the Club Secretary is also the Junior Affairs Officer for the Orpington & North West Kent League and is responsible for organising teams for the annual Kent Junior Inter-Regional Competition. Apart from the competitive aspect to the Senior Club, it is a very friendly and social club evening held on Thursday nights (again at the Harris Academy Sports Hall). However, this club evening is restricted to playing adult family members of our junior club membership, Club coaches and class assistants and can be by subscription or a simple pay and play arrangement. The General Data Protection Regulations (GDPR) came into effect on 25 May 2018. Protecting the personal data of our members and ensuring that we handle it in accordance with the law is of paramount importance to us. As a member of the Orpington Junior Badminton Club (OJs) we want to be able to contact you from time to time in relation to all matters relevant to your/your child's membership of OJs. The data you provide when joining OJs will be retained for the duration of your/your child's membership with us (and will be updated as necessary when annual membership is renewed and/or you advise us of any changes). We share your details with Badminton England (our national sports body) as all OJ members are registered with Badminton England as a requirement of the Club's insurance. Basic data (e.g. member's name, email contact) will be retained unless you request it be removed from our database. All other information you may have provided to us will be deleted from our membership database within 3 months of your membership ending. You may request that we remove your data from our membership database at any time by emailing the Club Secretary.